The practice of oil painting on stretched canvas in Southeast Asia has a recent history and reflects the development of colonisation in the region. Early extant examples in the Philippines date from the 1800s (Image1), in Thailand from 1856 (Image 2), in Singapore (Image 3) and Malaysia (Image 4) from the nineteenth century. Today there are vast collections of historic canvas paintings in public and private hands and this presents a number of interesting issues for conservation. Firstly the painting materials and techniques now used in Southeast Asian art were originally developed for temperate conditions. Secondly at high temperatures and high relative humidity, stress develops in the fabric support and the sizing layers become hygroscopic. Yet there are few extensive studies on the behaviour and conservation of oil painting materials in tropical climates. This research is a critical first step to assess the behaviour of canvas paintings in tropical climates, and is essential in providing informed advice on the care of such collections. The project was supported by an Australian Research Council (ARC) Linkage Grant from 2003-2006. It involved five partners across Australia and Asia. They included, in Australia, the Centre for Cultural Materials Conservation and the National Gallery of Victoria; in Malaysia, Balai Seni Lukis Negara (BSLN) (National Art Gallery in Malaysia); in Singapore, National Heritage Board (Heritage Conservation Centre (HCC); in the Philippines, the Jorge B. Vargas Museum and Filipiniana Research Centre, University of the Philippines at Diliman (UPVM) (supported by the Australian Embassy in Manila); and in Thailand the National Gallery in Bangkok (supported by the Australian Embassy in Bangkok). The Chief Investigators included Associate Professor Robyn Sloggett, Director, CCMC, and Associate Professor Ann Roberts, School of Physics, at the University of Melbourne. Partners in Malaysia are Ms Zanita Anuar, Curator, and Mr Amerudin Ahmad, Assistant Curator (Conservation), Balai Seni Lukis Negara; in the Philippines Dr Ana Labrador, Curator, and Ms Janice May Salvador, Collections Manager, JB Vargas Museum, and Assistant Professor Victoria Herrera, Department of Art Studies, University of the Philippines; in Singapore are LOH Heng Noi, Director, Mr Lawrence Chin and Ms NG Chong Quek, Senior Conservators, Ms Claire Lim, Paintings Conservator, HCC; in Thailand are Ms Piyarat Suksiri, Public Relations Officer, Australian Embassy in Bangkok, Mr Sakchai Pojunvanich, Director, and Mr Phongthorn Wongkietkachorn, then Curator, National Gallery Bangkok. The PhD student appointed to the project was Nicole Tse. Overall the collaborative nature of the three-year project developed a network of conservators who work with canvas paintings in tropical environments. 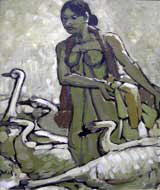 Canvas paintings in Malaysia, the Philippines, Singapore and Thailand from 1900s to 1965 are composed of a range of materials, techniques and practices. The origin of oil painting practice in these countries is undoubtedly European yet their materials and techniques vary according to the country in which they were assimilated. 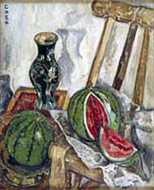 The local training opportunities and the availability of local or imported materials influenced the type of oil paintings produced, and more widely the surrounding social and cultural issues that impacted on the artist's choice of materials and techniques. 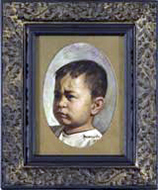 Over a period of three years two hundred and eight paintings were subject to detailed technicalexamined from Balai Seni Lukis Negara in Malaysia, the National Heritage Board in Singapore; the Jorge B Vargas Museum at the University of the Philippines and the National Gallery in Bangkok to identify what practices artist's adopted. Detailed research findings have been published and are listed in the project activities and included here is a summation of the common materials and techniques identified in this study. Of the surveyed works, 61% were on wooden strainers, and the remaining 39% were on stretchers. This assessment showed that the strainers appeared to be locally constructed, as evidenced by their use of local woods and their direct method of construction. This is hardly surprising given that strainers are much simpler to custom make compared to the more complex tongue and groove joins sued in the construction of stretchers. The strainers joins were simple or lappedmitres and as 70% of the works included a beveled edge, indicating that the makers were aware of the importance of an inner sloping edge and more importantly, standard painting practices. Their consistent manufacturing t echniques and use of local woods also suggests they were locally constructed. On the other hand, the stretchers were mainly constructed from a pine wood with strongly marked growth rings, beveled edge and tongue and groove join. 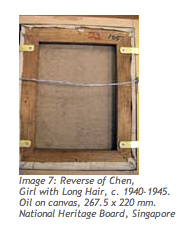 These characteristics are typical of imported Artists Coloumen stretchers and given that the species of pine wood are not native to Southeast Asia, this suggests they were imported. One of the stretchers too was marked with a Filipino 'Artist Coloumen' 'EL82' who set up business in 1882 (image 5). 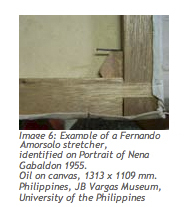 An exception though to this preference for imported stretchers was the great Filipino artist Fernando Amorsolo (1892-1972), whose stretchers appear to be locally constructed. His stretchers, representing 13% of the total auxiliary supports in this study, were constructed in a consistent manner using a complex tongue and groove joins with a beveled edge, and keys secured with a nail (image 6). One of the stretchers too was marked with a Filipino 'Artist Coloumen' 'EL82' who set up business in 1882 (image 5). An exception though to this preference for imported stretchers was the great Filipino artist Fernando Amorsolo (1892-1972), whose stretchers appear to be locally constructed. His stretchers, representing 13% of the total auxiliary supports in this study, were constructed in a consistent manner using a complex tongue and groove joins with a beveled edge, and keys secured with a nail (image 6). Cotton canvases appeared to be more commonly employed than linen or bast fibres. In this study, 66% were identified as cotton and of these 78% were plain weave. Eight of the cotton supports, (or 5% of the examined works), were marked with a European Artist Coloumen supplier's stamp confirming their importation. The origin of the remaining cotton canvases are unknown, although many interviewees recounted the use of cotton fabrics from local upholstery shops, often run by Chinese merchants. In this study, 28% of linen canvases were identified and 93% of these were plain weave. Their origin is likely to be linked to the importation of Artist Coloumen materials, given that linen is not grown or manufactured in Southeast Asia. Where linen has been attached to a strainer, the strainer appears to be locally constructed, as in the case of nine of Georgette Chen's works (image 7). This suggests that imported linen was cut from a roll. Similarly eight of Liu Kang's works (1911-2004), a significant Singaporean artist who trained in France and China, utilised linen supports, suggesting that linen canvases tended to be utilised by artists who were trained abroad. The identification of sizing layers however is particularly important for conservation studies of Western artists' materials in tropical Southeast Asia, given that it swells in humid conditions. Statements by artists in the Philippines indicate that rabbit skin glue was not used as it was too technical and it was not taught at the UP School of Fine Arts. In Kuala Lumpur, accounts by artists were often conflicting; for instance some stated that rabbit skin glue was introduced by Peter Harris, the English art educator who set up the Wednesday Art Group in 1952 in Kuala Lumpur. Whereas Peter Harris himself did not state he taught the application of rabbit skin glue as he said he focused his teachings on the aesthetic rather than technical practices. In the City of Singapore, apparently Liu Kang learnt how to apply rabbit skin glue when he trained in France as was also reported for the significant 19th century artists, Filipino Juan Luna (1857-1899) and Felix Resurreccion Hidalgo. In terms of the supply of rabbit skin glue in Malaya, Straits Commercial in Singapore stated they supplied rabbit skin glue but in small quantities and Nanyang Art Supply in Kuala Lumpur provided it only recently. In Thailand, the sizing of canvases appears to have been taught by Professor Silpa Bhirasri (1892-1962), an Italian artist who set up the Praneet Silpakum School (School of Fine Arts) in 1934 and later Silpakorn University in 1943. The arrival of 'Artists Coloumen' companies is an important historical demarcation that contributed to the use of Western artists' materials in Southeast Asia. The early art supply shops important to this study include the Malaysian Nanyang Book Company established in 1943 in Kuala Lumpur and Penang; Straits Commercial established in 1947 in the city of Singapore, EL82 established in 1882 in Manila as well as Enriquez Art Supply early in the 1900s; and Mohameds, who supplied the Royal Court, around the 1940s in Bangkok. They emerged when European and American 'Artists Coloumen' companies were active and Malaya, the Philippines, the City of Singapore and Thailand were becoming increasingly international in their focus. The supply of imported 'Artists Coloumen' materials, however would have been interrupted during the Second World War being an important demarcation in the selection of materials by artists. Nineteen imported 'Artists Coloumen' stamps were recorded on the reverse of painting supports, backboards or auxiliary supports; these represent 9% of the examined works. Many of these artists had trained abroad or enjoyed the status and material conditions that allowed them to obtain such artist materials. Of these imported nineteen stamps, ten were identified in the Philippines, four in Singapore, two in Thailand and two in Malaysia. 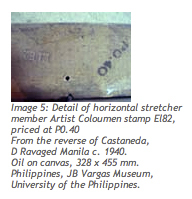 The larger number of Coloumen stamps on Filipino work examined is possibly linked to the fact that canvas painting practice in the Philippines has a longer history enabling a skills base to develop and foreign materials to be sought. This is also supported by the fact that three of the works with European 'Artists Coloumen' stamps in the Philippines were double stamped with a local supplier. The Filipino suppliers include El82, Arte (image 8) and La Paleta de Plata (image 9). Interestingly one work by Mohd. 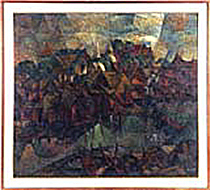 Hoessein Enas (1924-1995), an important Indonesian born Malaysian artist, was marked with a Joyo canvas stamp from Japan obviously relating to Japanese occupation of Malaya (image 10). Electronic Speckle Pattern Interferometry (ESPI) has the ability to measure the deformation of materials over time. Dimensional change sensitive to one wavelength, which is not even visible under a microscope, was measured with ESPI being a non destructive optical technique incorporating simple technology. A transportable in-plane ESPI unit was built at the University of Melbourne (Centre for Cultural Materials Conservation and theSchool of Physics) for use in the four institutions. An in-plane interferometer with a 633nm diode laser was used to highlight the oil paintings and then imaged with a CCD camera for computer software analysis. The in situ ESPI measurements were taken in tropical museum environments where climatic conditions ranged from non climate controlled to intermittent or continuous use of air conditioning. In 2005 in situ analysis was undertaken and in total, twelve canvas paintings were examined. 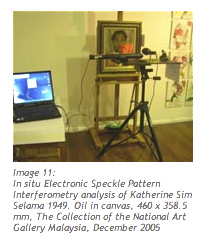 Image 11 and Image 12 shows in situ analysis in November and December 2005 at Balai Seni Lukis Negara (National Art Gallery Malaysia) in Kuala Lumpur and the Singapore Art Museum, Singapore. Results showed subtle dimensional movements of the canvas support as the relative humidity and temperature changed, as illustrated in the fringe images below. 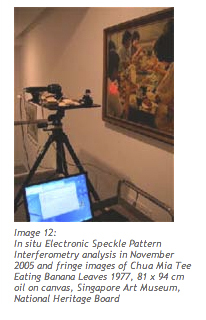 In 2004 earlier ESPI research was undertaken by Elaine Miles, then an Honours Physics student, titled Investigation of strain in artists' canvases due to varying humidity conditions using Electron Speckle Pattern Interferometry (ESPI) (a copy of her report can be obtained on request). Elaine is now continuing PhD studies in the Non destructive Imaging Techniques for the Investigation of Subsurface Structure in Artwork in the School of Physics with the support of Centre for Cultural Materials Conservation. Elaine is continuing some of the earlier ESPI work including phase shifting to quantitatively determine the degree and direction of dimensional change.